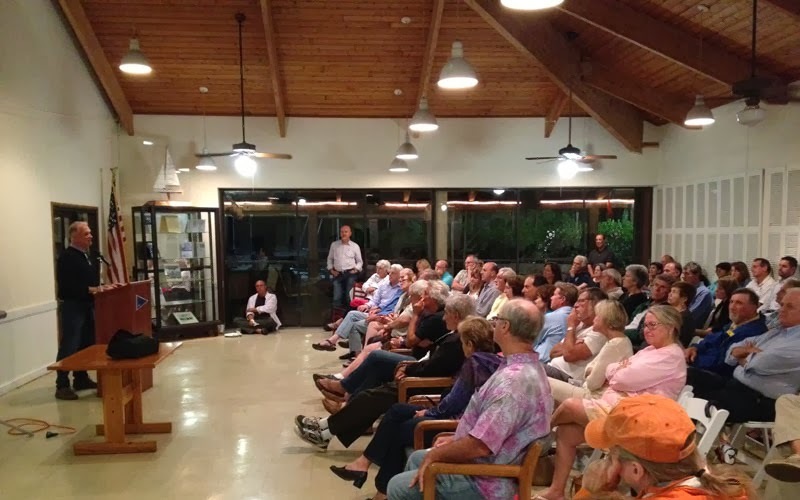 This past Wednesday evening, Nan and I went down to the Coconut Grove Sailing Club for a lecture and book signing by our friend John Kretschmer. 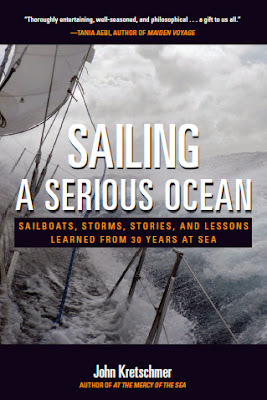 His new book, Sailing a Serious Ocean: Sailboats, Storms, Stories, and Lessons Learned from 30 Years at Sea, came out at the end of October, and this event was the kick-off of his far-flung book tour. There was a great turn-out by club members and the general public to hear John talk about the book and his long history in sailing, and then to buy a copy for him to sign. I wanted to get three copies but then others would have missed out on the limited supply, so I settled for one and had John sign it for my father, who had so enjoyed one of John's earlier books, At the Mercy of the Sea: The True Story of Three Sailors in a Caribbean Hurricane. I have known John Kretschmer since 2007 and sailed with him on four of his trips, including the Odyssey trip he details in this book. Sailing with John is an opportunity for sailors looking to broaden their horizons to mitigate the inherent danger. His steady demeanor and many years of offshore experience turn potentially terrifying storms into exciting learning experiences. When conditions are calmer, there is time for talk, and John is happy to share his hard-earned advice and recount his incredible sea stories. Reading his new book had me smiling and nodding in recognition. It’s all in there, all that John has learned over the course of his sailing career, what worked and what didn't, illustrated through real-life examples. This book is one that every active or armchair sailor will want to read and keep for reference. It was good to see John and his wife Tadji, if only briefly. We chatted before the lecture and he mentioned that he would be home in Fort Lauderdale until he leaves in early January to sail his boat Quetzal from the Canary Islands to Antigua. He said the four of us should plan on getting together for dinner sometime before then. It took five long days of low-speed, low-mileage driving, but we did finally make it to Miami. 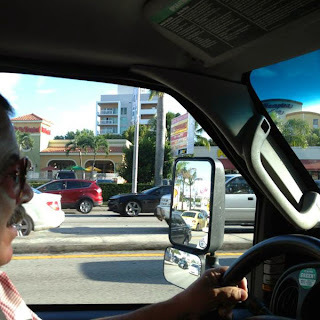 The photo shows us on the evening of our arrival, passing our new Coconut Grove apartment building on our way to U-Haul to get the car taken off the trailer. That was almost four weeks ago. Since then, we have settled in to our tiny new apartment, I have started my new job, and we have picked up Scout from Monica and Vicky's care. They looked after him in Bentonville while we finished our relocation, which was especially helpful because we were unable to move in to our apartment right away, due to a delay in the homeowner board's approval process, and needed to stay in the pet-free hotel next door for three nights. Mobile, Alabama is halfway between here and Bentonville. Last weekend, Nan and I drove there to meet Monica and Vicky for Scout's hand-off. He was sporting a cool new puppy cut and was overjoyed to see us. After all that has happened in the last seven months, he must be feeling more than a little confused and insecure. The three of us have spent the past week establishing new routines to get Scout comfortable in his new surroundings. There are two dog parks within walking distance, and they are always full of dog buddies to meet and romp with. Nan takes Scout on walks both morning and evening that usually have the closer dog park as the turnaround point. I join them for the evening walk if I get home from work in time. Together, we are settling in to our new life here in Miami. It feels at times like starting over, but I know that it's really just another step in our long journey. We're already looking ahead to sailing the boat up here from Mexico next spring.